Data can help physicians and pharmacists make smarter patient care decisions, but the way in which physicians receive that data plays a huge role in whether the information drives higher-value care. Targeted to their specific needs at that moment in patient care. Many health systems are struggling to meet these three objectives. In fact, turning data into actionable information is the most pressing health IT challenge healthcare organizations face, according to a recent survey of 100 healthcare executives by Managed Healthcare Executive. At HIMSS 2019, Nicholas Desai, MD, system chief medical information officer at Houston Methodist, shared how his organization is addressing this challenge. To download the PDF case study, click here. Houston Methodist—which is made up of seven hospitals, eight emergency care centers, and a large network of more than 6,700 affiliated physicians and 675 employed primary care and specialty physicians—recently embarked on a 90-day pilot to test how integrating clinical alerts into its EMR workflow could help physicians and pharmacists make more cost-effective, higher quality care decisions. About 130 clinicians and 38 pharmacists were involved in the pilot, said Desai, during his presentation at the VigiLanz booth on Wednesday, February 13. The alerts were pulled from a variety of sources, including Houston Methodist’s own data and data from its partners, such as VigiLanz. 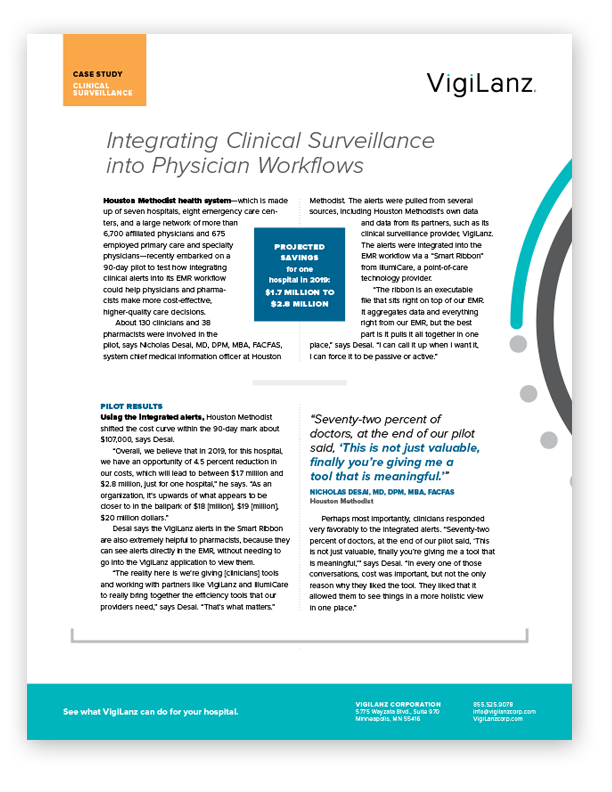 The alerts were integrated into the EMR workflow via IllumiCare’s Smart Ribbon. When integrating alerts into the EMR, consider passive and active alerts that you want to make front and center. For example, if there are five drugs your organization is watching and monitoring closely, consider how you can use alerts to highlight those as top of mind for clinicians. Bring various stakeholders to the table to help determine what type of alerts and data should be integrated. For example, if your organization’s PDMP task force is involved, it might reveal that integrating PDMP-related reports is key. The results of the pilot are impressive. The organization was able to shift the cost curve within the 90-day mark about $107,000, said Desai. Desai said the VigiLanz alerts in the Smart Ribbon are also extremely helpful to pharmacists, because they can see alerts directly in the EMR without needing to go into the VigiLanz app to view them. This post has been updated from a post previously published on February 28, 2019.